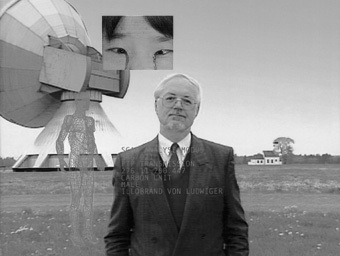 A cubo-futuristic portrait of the physicist Illobrand von Ludwiger and his transcendental imagination of the six-dimensional, unified quantum field theory in the area of serious research into UFOs. Romeo Gruenfelder was born in 1968 and studied Visual Communication, Philosophy and Classical Music at the Hamburg Hochschule fuer bildende Kuenste from 1995-2001. In 2001, he founded felderfilm (www.felderfilm.de). His films include: Jimmy Jenseits (1993), Sorgenbrecher (1995), Himmel ueber Freiburg (1995), Der blonde Engel (1996), Shahrzadeh Scampolo (1996), (2000), Borderline Pilots (2002), Rallye 35 mm (2004), 4 kurzeDialoge (2005), and desi\'re: - The Goldstein Reels (2006).